Brad and I have been trying to eat healthier lately. We go through phases where we eat pretty healthy and then find ourselves eating out too often or just eating too many processed foods. So everyone once in a while one of us will say to the other “I feel yucky. We need to eat more vegetables”. In the summer, eating healthier to us means eating a lot of salads. We’ll throw in some grilled or sauteed veggies here and there, but salads are easy and more…summery. Plus, I seem to have a never-ending supply of salad ideas in my head, which doesn’t hurt our quest to eat more salads. 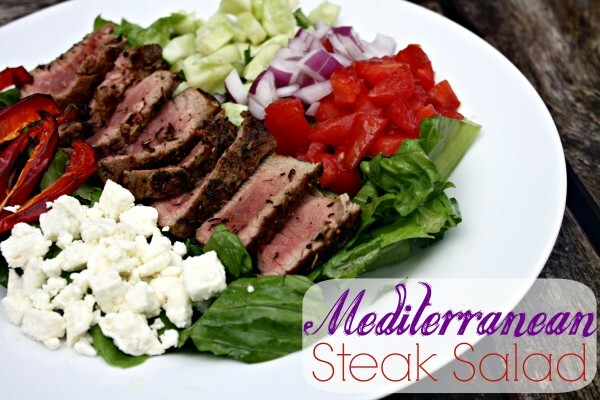 This salad has a Mediterranean spin, except it uses steak crusted with Mediterranean herbs instead of the usual chicken you see in similar salads. I had to throw in roasted red peppers because I LOVE them. Isn’t that reason enough? Cooking time for your steak depends on your preference of “doneness” and the thickness of your steak. There’s also some taste differences between which cuts you’re using – the difference between prime rib and ribeye is the taste and tenderness, for example. Here’s a handy chart to help you. 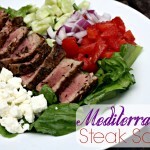 A fresh summery salad made hearty with the addition of filet mignon with fresh Mediterranean herbs. Warm olive oil in a pan on medium heat. Sprinkle steak evenly on both sides with thyme, rosemary, and salt. Place steak in pan. When steak has browned thoroughly, flip to cook the other side, until cooked to your preference. Herbs will toast and brown, but if they start to burn, put in a baking dish and finish in the oven on 350 degrees until cooked to your preference. Once cooked, set aside to cool for 5 minutes. Turn oven to the broil setting on the highest temperature. Toss red pepper slices in the 2 teaspoons of olive oil. Place on a baking sheet so that none of the peppers overlap. Broil for about 7-10 minutes or until edges start to blacken. Remove from oven and set aside to cool for a few minutes. Assemble salad, plating lettuce on two plates. Make the lemon vinaigrette by mixing ingredients well in a small bowl, then pour evenly over both salads, tossing to combine (you may have some vinaigrette left over). 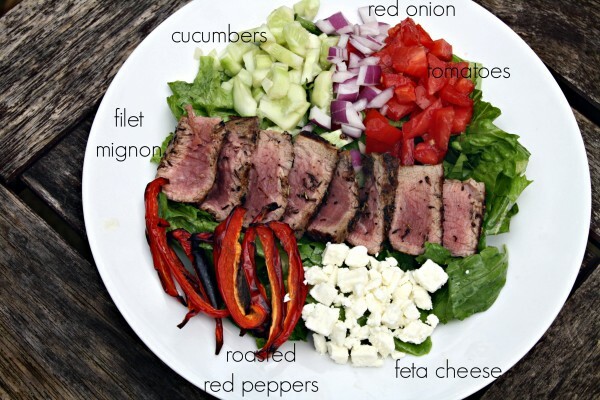 Distribute tomatoes, cucumbers, onion, feta cheese, and red pepper evenly between the two salads. Place steak on a cutting board and cut thinly. 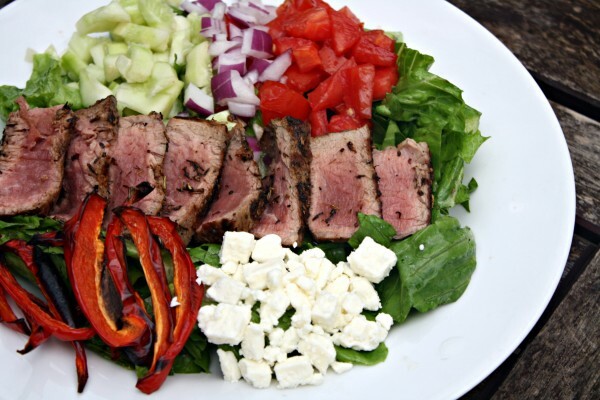 Distribute steak between the two plates of salad and serve while the steak is still warm.